"There is no reign of terror and tyranny in the Philippines." 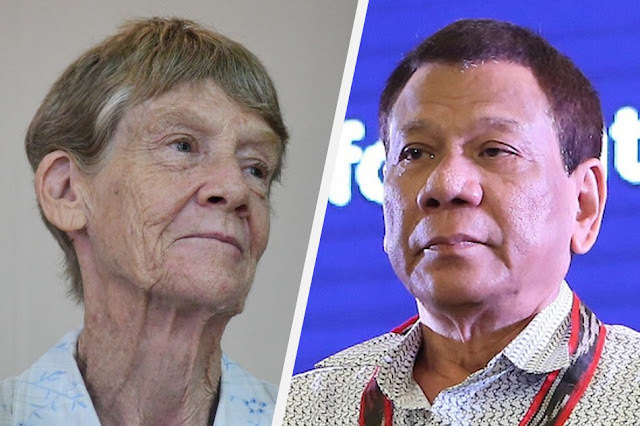 Malacañang on Monday slammed Australian nun Patricia Fox for claiming that there is a “reign of tyranny” in the Philippines under the administration President Rodrigo Duterte due to the alleged rising number of alleged human rights abuses in the country. Reign of fear to all law violators. In a statement, Presidential Spokesperson and Chief Presidential Legal Counsel Salvador Panelo, rejected Fox's claim and said she might be referring to a reign of fear to all law violators in the country and not a reign of terror. “There is no reign of terror and tyranny in the Philippines. There is only a reign of fear in the minds and hearts of those who violated the law. They are terrified that the law is finally running after them. What we have is a reign of strict enforcement of the laws,” Panelo said. Panelo has also said that what happened to Fox "was a classic case of an inappreciative tourist" prompted the gov't authorities ordered her to leave the country after the Bureau of Immigration (BI) refused to extend her visa. "This is a classic case of an inappreciative tourist who saw nothing good and complained about the country which graciously extended its hospitality." he wrote. Panelo in the same statement also said that majority of the Filipinos acknowledged and supported the efforts of Duterte administration to eradicate the problem of illegal drugs in the country citing the recent Social Weather Stations (SWS) survey. "Close to eight of ten Filipinos believe that the country is on the right direction, according to the latest Social Weather Stations (SWS) survey." he wrote. Despite all the criticisms thrown against the current administration on its intensified campaigns to end illegal drugs in the country, Panelo stressed that "the Administration continues to adhere to the rule of law." "The President follows the command of the Constitution for him to enforce the laws of the land regardless of who is involved. Let no person, therefore, take lightly the President's duty to serve and protect the people." Panelo stressed out. Sister Fox, who arrived back in Australia said “the human rights abuses are just increasing and it’s a reign of terror. Of tyranny.” citing Duterte’s supposedly violent crackdown on the drug trade. "At present, the Philippines, the human rights abuses are just increasing and it is a reign of tyranny at present. There has been a culture of impunity for a long time and it is getting worse." the nun said. The order of denying the extension of Fox's visitor's visa cited the Board of Comissioners' previous resolution finding a significant evidence that Fox participated in partisan politics which is in violation of the terms of her missionary visa prompted them to deport Fox. In a separate statement of Panelo reiterated, that Fox's departure from the country only indicates that foreigners citizens while staying in the country are limited to specific rights that do not include joining political protests. 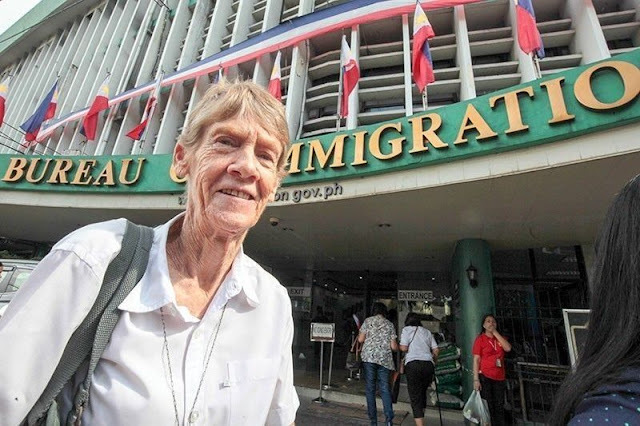 "The departure of Sister Patricia Fox is a timely reminder to all foreigners who stay or sojourn in this country that they are not entitled to all the rights and privileges granted to the citizens of the Philippines." "Including the absolute exercise of political rights inherently exclusive to Filipino citizens, as spelled out in Operations Order No. SBM 2015-025 issued by the Bureau of Immigration (BI), approved by then Secretary of Justice Leila de Lima." Panelo stressed out. 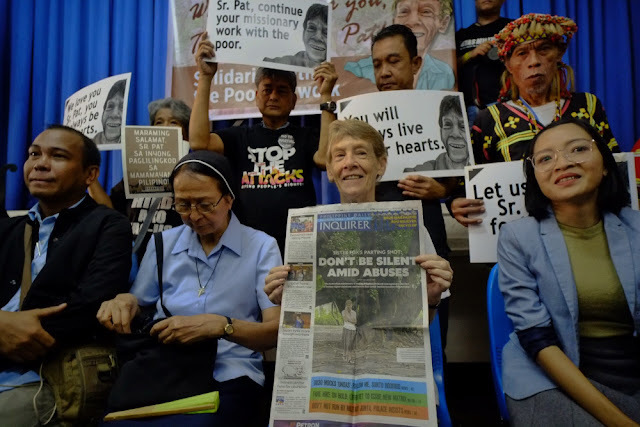 We take exception to the remarks of Sister Patricia Fox on the Administration’s war against drugs saying that it is “a reign of terror and tyranny.” This is a classic case of an inappreciative tourist who saw nothing good and complained about the country which graciously extended its hospitality. There is no reign of terror and tyranny in the Philippines. There is only a reign of fear in the minds and hearts of those who violated the law. They are terrified that the law is finally running after them. What we have is a reign of strict enforcement of the laws. Close to eight of ten Filipinos believe that the country is on the right direction, according to the latest Social Weather Stations (SWS) survey. Another survey pointed out that a sizeable majority of Filipinos, 69%, acknowledge the efforts of the current administration to eradicate the problem of illegal drugs in the country as its most important achievement. These figures immediately repudiate Sister Fox’s misplaced, if not offensive, remarks towards our country. The Administration continues to adhere to the rule of law. The President follows the command of the Constitution for him to enforce the laws of the land regardless of who is involved. Let no person, therefore, take lightly the President's duty to serve and protect the people.